When walking for fitness and health, one shoe option is the AEROsystem line of shoes sold by The Walking Company. AEROsystem shoes are available in several styles. Besides "neutral" designs that will work for anyone, there also are AEROs specifically for people who need help with motion control or stability. There are styles for men and women in regular and wide widths. You can buy ABEO AEROsystem shoes online or at a brick-and-mortar The Walking Company store. Either way that you purchase the shoes, you can choose a customized footbed that is either neutral, has metatarsal support, or has a posted heel. If you purchase them at a store, you get a complimentary digital foot analysis to determine the height of your arch and to home in on specific pressure points of your foot. This information can help the salesperson recommend the footbed type with the exact amount of arch support you need and that will be most stabilizing for your foot. You won't find this same degree of customization at regular athletic shoe stores or in most other athletic shoes. This is a big advantage when buying shoes at The Walking Company. The included ABEO 3D3 CORE sport orthotic provides cushioning, energy return, and breathability. You can upgrade to the ABEO 3D3 Max Performance orthotic which has a cork and rubber core for more support and stability. Both of these orthotics have the Seal of Acceptance from the American Podiatric Medical Association. A supple sole. It can be hard to find your stride in a stiff shoe. The soles of ABEO AEROsystem shoes are flexible enough to allow your foot to move comfortably. They are intelligently designed to flex in the correct area for walking and running. Comfortable cushioning. The AEROsystem line has "channeled air chambers" in the sole to provide cushioning, shock absorption, and energy return. They feel good on the feet even if you're standing still for long periods of time. An ideal heel. The heel of the shoe is rounded, rather than flared, and is in the same plane as the front of the shoe—in other words, the back of the shoe is neither higher nor lower than the front. For most people, a flat shoe is better for walking than one with an elevated heel. Smart laces. The lacing system has a tongue retainer slot for keeping the shoe tongue in place. The ABEO AEROsystem shoes also have an extra set of lacing holes at the ankle. This allows you to lace them for an extra degree of stability in the heel if needed. Well-constructed uppers. The shoes are designed to last. Durable outsoles. They're made from a high-tech material called Vibram MultiTrek. The bottoms of the shoes don't have deep channels in which tiny rocks and other bits of debris might get stuck. The AEROsystem models change from year to year, so it is best to check for the current offerings. The Walking Company updates styles to include new technology and keep the line fresh. ABEO AEROsystem Delany: Women's shoe for running and brisk walking. It has a medial post for support and good forefoot flexibility. Available in two colors and medium and wide versions. 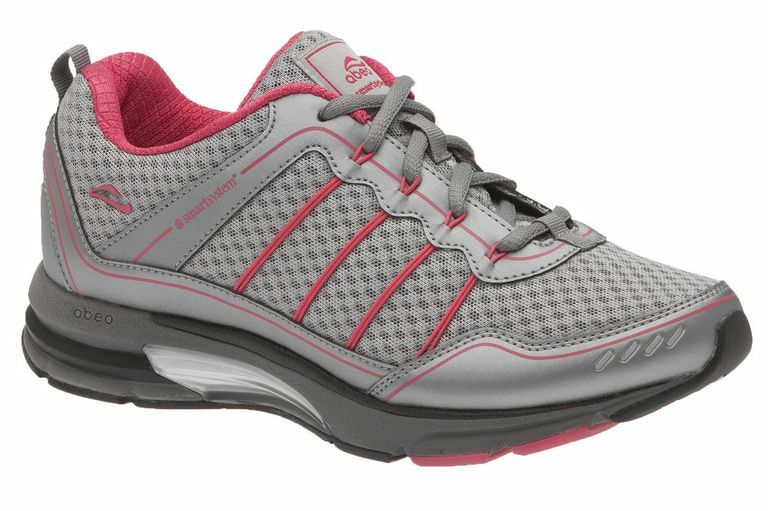 ABEO AEROsystem Symbol: Women's lightweight running and brisk walking shoe. It has motion control elements including a TPU shank and medial post. Available in two colors and medium and wide. ABEO AERO Janet: Women's trail shoe with a gusseted tongue to keep out trail debris, water-resistant membrane to keep your feet dry, and high-traction sole. Available in two colors and in medium and wide. The Walking Company keeps the AEROsystem line updated with good running and walking shoe technology. It is well worth visiting their store to get the free foot analysis and recommendations as to which type of running or walking shoe and insole are best for you. This can make a world of difference compared to going to a non-specialty store to buy your shoes. Having a choice of footbed and insoles make these shoes a smart choice. Their running shoe designs are appropriate for walking fitness.